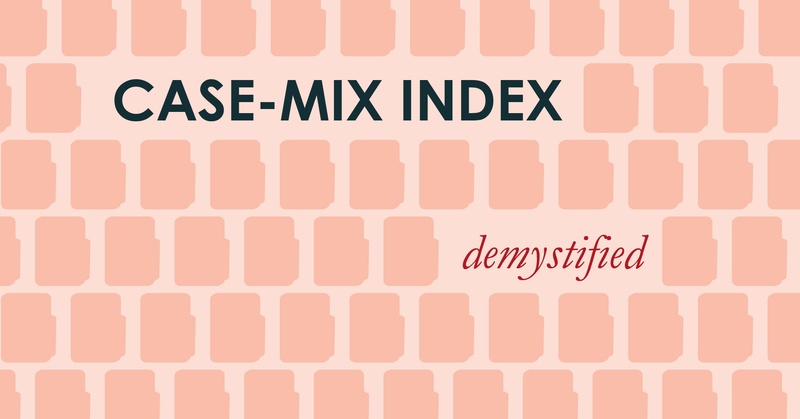 The Case-Mix Index (CMI) has been defined in many ways. One definition might read "a relative value assigned to a diagnostic-related group." Another may be "a rough estimate of how sick a hospital's patients are." Yet another could be "an indicator of how much reimbursement is expected by the hospital." All these definitions point to one fact: The CMI is a measure used by a variety of healthcare personnel in a variety of ways. Today we will begin our exploration of this multi-faceted number. So, where to start? Let's first look at a MS-DRGs, an essential component of the CMI formula. Hospitals are paid for services by sending the treatment data on a patient to a third-party payer (Medicare or an insurance company) and then receiving a reimbursement. To avoid hospitals sending these payers a bunch of invoices with all different kinds of data in different formats, the Centers for Medicare and Medicaid Services (CMS) decided to standardize the data in the 1980s, and the insurance companies followed their lead. The result was the creation of Medicare Severity-Diagnostic Related Groups (MS-DRG), 700+ standardized diagnoses into which all patients were sorted. All patients with pneumonia would be in the pneumonia MS-DRG, all heart transplant patients in the heart transplant MS-DRG, etc. In addition to their MS-DRG, a patient will also get other assigned codes, such as an ICD-10 code for what they came into the hospital for, as well as CPT-4 codes for what procedures they had, and possibly HCPCS codes for any non-physician services they received (such as an ambulance ride). But these codes are not used to generate the CMI, only the MS-DRG. Each year, CMS assigns a weight to each MS-DRG based on the average cost to treat a patient in that DRG. Each of the degrees of severity (with mcc, with cc, without cc/mcc) has its own weight - lower for least expensive, higher for most expensive. That weight is also adjusted to account for hospitals facing unusual challenges, such as treating a high number of low-income cases or being a teaching hospital. Now that each patient case has an assigned MS-DRG, you can calculate the CMI. We'll continue with that portion of the calculation in our next post!